LE REGAL is located at 340 GEYLANG ROAD in district 14 (Eunos, Geylang, Kembangan) of Singapore. LE REGAL is a Freehold Condo development consisting of 88 units. LE REGAL is completed / TOP in 2016 (estimated), developed by FRAGRANCE REALTY PTE LTD.
Educational institutions like ETONHOUSE INTERNATIONAL SCHOOL, CANADIAN INTERNATIONAL SCHOOL (TANJONG KATONG), CHATSWORTH INTERNATIONAL SCHOOL (EAST), GEYLANG METHODIST SCHOOL (PRIMARY), KONG HWA SCHOOL and MACPHERSON PRIMARY SCHOOL are near to LE REGAL. LE REGAL is accessible via nearby ALJUNIED, MOUNTBATTEN and KALLANG MRT Stations. Very conbinient near city and many shops. Great city living for single, couple and expats. Very convenient location and friendly neighbors. 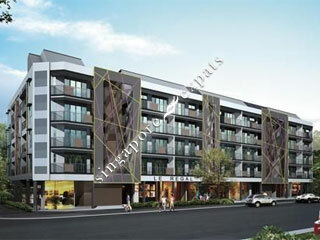 City Fringe, Near MRT, CBD, good food & amenities within walking distance. Lively district. Excellent amenities and many nice eateries. Very near to city. Buses and MRT is within walking distance of 10 minutes only.